Carlos Tevez struck as Manchester United defeated Roma to seal a Champions League semi-final match-up with Barcelona. Roma should have taken the lead from the penalty spot after a foul by Wes Brown but Daniele de Rossi smashed the ball high over the crossbar. Edwin van der Sar denied Mirko Vucinic as Roma threatened but Ryan Giggs and Owen Hargreaves forced saves from Doni. 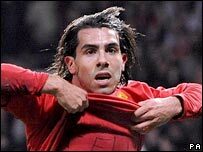 And Tevez scored with a diving header from Hargreaves' cross to seal the tie. The Argentine struck after 70 minutes and it was a goal that punctured any lingering hopes Roma harboured of a dramatic comeback. The Italians had been left stunned after their 2-0 defeat in Rome but, after enduring a poor start to the second leg, they showed great spirit to rattle their opponents. And they might have ensured an extremely nervous evening for United had De Rossi not been so wasteful with his penalty kick after 29 minutes. 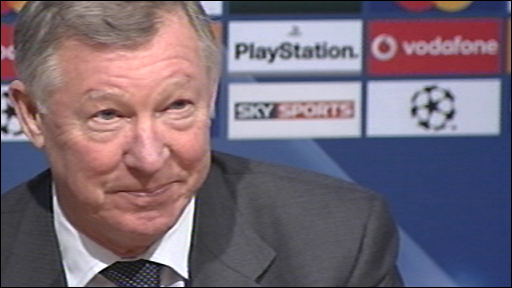 United boss Sir Alex Ferguson had shown great faith in his squad prior to kick-off by leaving Wayne Rooney and Cristiano Ronaldo out of his starting line-up. They were two of five changes from the team that drew at Middlesbrough on Sunday. Changes or not, United had more than enough opportunities to kill off the tie in the first 10 minutes. Park Ji-Sung shot wide after superbly holding his run to stay on-side, Brown completely lost his marker from a corner but then headed over while Doni denied Hargreaves after Giggs brilliantly played the midfielder through on goal. Having resisted United's early advances, the Italians underlined the threat they possessed when Vucinic drew a save from Van der Sar with a strike from a tight angle. But Hargreaves was a revelation down the right for United, using his superb athleticism to run on to passes from midfield, and he delivered two telling crosses. The first was met by Giggs while Anderson drilled a low strike from the second - both efforts drawing saves from Doni. But Roma should have forced their way back into the tie when referee Tom Hennin Ovrebo ruled that Brown had failed to make any contact with the ball while trying to tackle Mancini. De Rossi buried his head in his shirt after blazing the spot kick way over the crossbar but Roma took confidence from winning the penalty and enjoyed a spell of possession that saw them end the half on top. And Roma maintained their sense of momentum after the break - Marco Cassetti just failing to pounce on a rebound, Mikael Silvestre blocking from Rodrigo Taddei and Van der Sar saving a Juan header. It was in stark contrast to the early minutes when United dominated, however a relatively mundane period of play, in which the home team enjoyed a reasonable spell of possession, settled Sir Alex Ferguson's team. And after Tevez headed home another excellent Hargreaves cross the tie was effectively settled. Further good news for the buoyant home fans arrived with 10 minutes left when Gary Neville came on for his first appearance since picking up an ankle injury on 17 March 2007. Man Utd: Van der Sar, Brown, Pique, Ferdinand, Silvestre, Hargreaves, Park, Carrick (O'Shea 74), Anderson (Neville 81), Giggs (Rooney 74), Tevez. Subs Not Used: Kuszczak, Ronaldo, Scholes, Welbeck. Roma: Doni, Panucci, Mexes, Juan, Cassetti (Tonetto 56), De Rossi, Pizarro (Giuly 69), Taddei (Esposito 81), Perrotta, Mancini, Vucinic. Subs Not Used: Curci, Cicinho, Aquilani, Brighi. BBC Sport Player Rater man of the match: Man Utd's Owen Hargreaves 7.94 (on 90 minutes).